You're 200 percent more likely to get the flu this year than last, and 400 percent more likely to get it than you were two years ago. At the same time, a national IV bag shortage could leave hospitals scrambling to treat all those patients. Tampa Bay area walk-in clinics are slammed with patients like Adalyn Fryberger and her mom Christi. Christi just found out on Monday that she's the latest victim of the flu. "I can't believe it. I don't think I've ever had the flu before," she said while holding a flu diagnosis from a Bay Care Convenient Care location in St. Petersburg. Robby Flanagan is coming down with the flu, too. "It's definitely frustrating. I don't ever like to not feel good so anytime I can avoid it that's the course I prefer to take," he explained. Avoiding the flu this year is harder than ever. The cold weather helped the virus fester, as we all stayed inside. The flu vaccine is only 10 percent effective this year, although Tampa General Hospital Nurse Nancy Epps says it's still best to get one. "It's better than nothing and it really is the only prevention that's out there." Nearly every hospital in Tampa Bay is dealing with a big spike in patients. The Florida Hospital Group is seeing triple the amount of flu patients at their Tampa Hospital compared to this time last year. Johns Hopkins All Children's Hospital and the Largo Medical Center have also seen a spike in the number of flu cases. At the same time, hospitals are dealing with a national IV bag shortage. Hurricane Maria caused one of the largest suppliers, Baxter, in Puerto Rico to stop production. Local hospitals tell us so far the shortage has impacted their supply, but has not impacted patient care. Many hospitals have switched to pills or giving injections with medication to use the IV bags more sparingly, but as flu cases rise, it's something they're watching very carefully. Hospital workers best advice: As tough as it may be, stay home when you're sick. That's difficult for Flanagan. "It's not like when you're a kid and you miss school. Work is a lot more important and you can't always afford to miss it," he explained. The flu virus is typically contagious for 3 days. It's not just Tampa Bay. 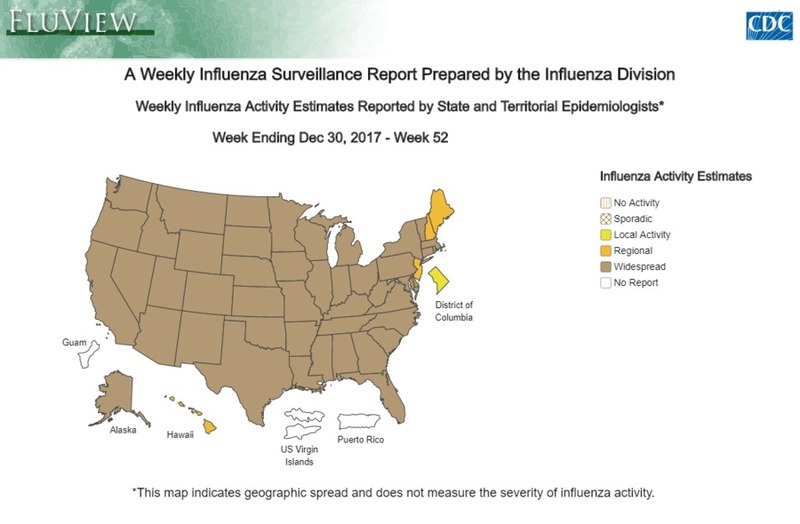 Influenza is on the rise across the country, according to a new Centers for Disease Control and Prevention report . The CDC says that flu activity in Florida is considered 'widespread'. The number of jurisdictions experiencing high activity went from 21 states to 26 states and New York City and the number of states reporting widespread activity went from 36 to 46. Influenza-like illness (ILI) went from 4.9% to 5.8%, according to the CDC. Although the CDC says that this year's flu vaccine has only been 10 percent effective, they say that the best bet for fighting the flu is to get a flu shot. Check with your physician, your county health department, or click here to find a list of locations to schedule your flu vaccine. Guam, Puerto Rico and the U.S. Virgin Islands did not report. To locate a flu shot, click here.